Pouring through the Australian Drag Racing records, few names come up as often as Gary Phillips. In fact, his claim as ‘Australia’s Winningest Driver’ isn’t unsubstantiated – including the inaugural 400 Thunder Championship, Gary has 19 other Championships to his name over the course of his career, making him the most successful driver the country has ever seen. But it’s not just Championships piling up in the Phillips family home, Gary has been at the forefront of Pro Alcohol and this year alone was the first Pro Alcohol car to runs in to the 5.3s, and to run over 270mph. Starting with an almost entirely-new combination, Phillips strung together an incredible season, turning Top Qualifiers in to Wins at just about every round. It was no surprise that heading in to the final round of the season, the Winternationals, he and the rest of his Lucas Oils operation had a comfortable lead over the rest of the field. “Anyone who qualifies in Pro Alcohol these days is a tough race!’ exclaims Gary of the incredibly competitive line up of cars and drivers. “For the Championship to come down to one of the last races at the last round of the season shows how close the field is, and how consistent our car is,” he goes on to explain. “It was better than having to come from behind!” laughs Gary about the fortunate position he was in at that stage in the season. “It allowed us to focus on running as well as we could, given the track conditions which were perfect. Luckily for us the Championship didn’t come down to the last race – once we ran our 270mph run (Australian record) in the Semi Finals we’d won it,” he explains. On that particular run, Phillips reveals that the car which he describes as “a rocket” clocked 217mph to the half-track. “That’s faster than anyone, anywhere regardless of the rules,” he explains, alluding to the subtle differences in Pro Alcohol depending on the region of the world. 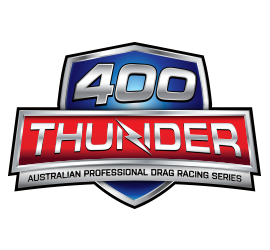 “400 Thunder is a new era for the sport, but we’ve been doing what we do for a long time and we’re focussed on that – continued success,” Phillips explains of his reaction to the 400 Thunder crown. “400 Thunder is a new challenge, no doubt, but the network of the best tracks in the country, truly world class tracks, allows us to keep performing at our best – that’s what keeps us going fast,” he adds in a statement ladled with his decades worth of experience and racing wisdom. “Next year we will have been with Lucas Oil for twenty years, and while there hasn’t really been a break in racing that we could consider an ‘off-season’ we’re busy repairing the car from the damage sustained at the Winters. The body is repaired and sign written again and from there we’ll just go through and take inventory of what we’ll need for the next season, and go through and get the car right again,” Phillips explains of his preparations for another assault on Pro Alcohol in the 2016/2017 season. “We’ll be ready for Sydney in November!” he exclaims in closing.